For an NFL LB, does it get any more embarrassing? Now, there are plenty of ways to read into this one. • Perhaps on the night the Bears honored Mike Ditka, Chicago’s offense decided to do its best Monsters of the Midway impression. • Maybe the Cowboys, playing in a billion-dollar palace and never at a shortage of attention, have just turned into the fat cats of the NFC. • Sean Lee was just coming back from a hamstring injury and left the game with a neck injury — perhaps he is just prone to getting banged up. 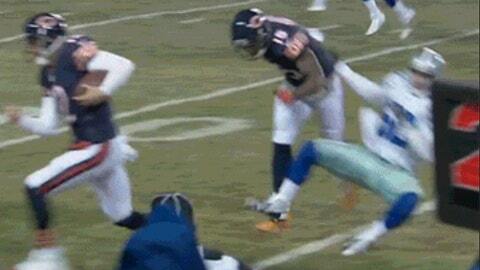 But whatever the reason, there is no denying: Brandon Marshall blew up the Dallas linebacker with this crushing block. And if that’s not bad enough, the Bears cleaned the Cowboys’ clocks on the scoreboard, too, crushing Dallas at Soldier Field on Monday night, 45-28. On the play above, Marshall (6-foot-4 and 230 pounds) leveled the unsuspecting Lee (6-2, 234) linebacker during the second quarter, allowing QB Josh McCown to scramble for a first down. The Bears would score on the drive to take a 14-7 lead. Now only one question remains: It’s December, so how will the world figure out how to pin this play on Tony Romo?